This Poppy Seed Roll with Cream Cheese recipe is a soft yeast bread roll with cream cheese and poppy seed filling. This easy recipe will become a favorite, without a doubt. 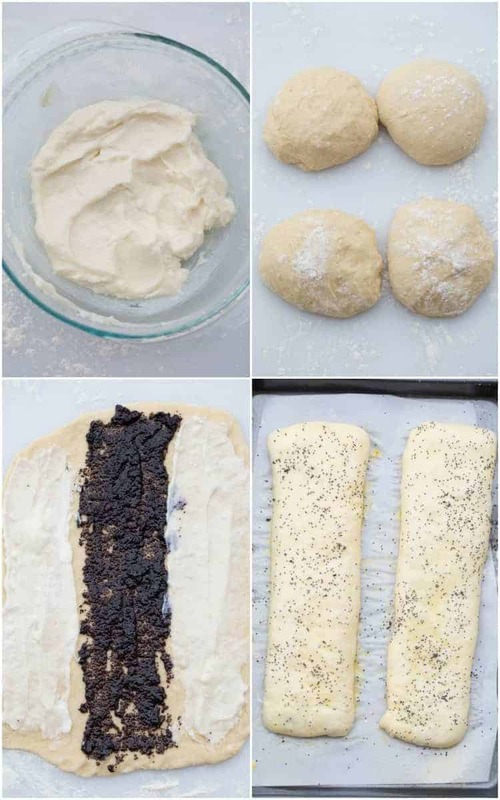 The combination of cream cheese and poppy seed is out of this world delicious and goes so well with this homemade soft dough recipe. 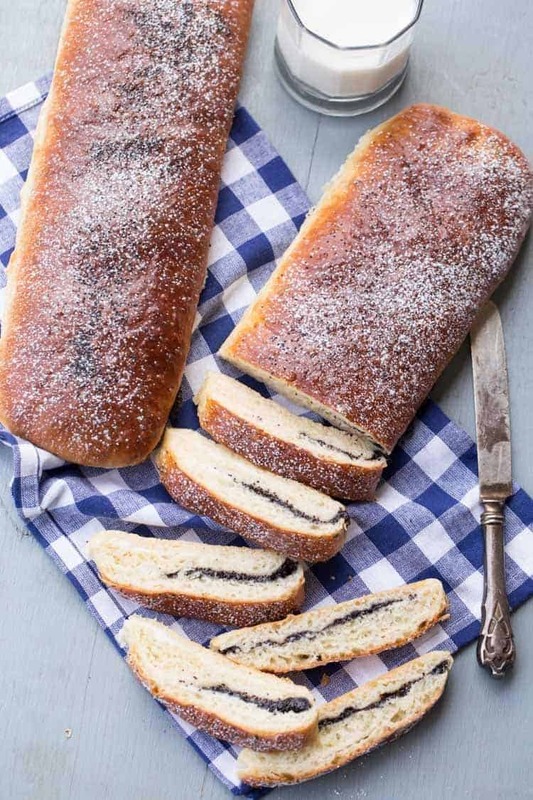 Try this Poppy Seed Babka recipe! One of the most popular dessert recipes on my blog is the Cherry Cheesecake Buns. That has to be the most sent in recipe people e-mail me with that don’t have social media but want to share their pics. I absolutely love opening each e-mail and am so blessed you tried our recipe and it was a success in your kitchen. Just makes me grin really big and feel like we are a part of your kitchen as well! I love how you took that recipe and added subbed the cherries with blueberry pie filling, fresh raspberries and even strawberries. You are all so creative! Thank you. We were having guests over not too long ago. We had cherry cheesecake buns earlier that week so I wanted something different but with that particular easy dough. I thought what a phenomenal combination poppy seed and cream would be as a roll (roulade or rylet in Russian). I baked it and was beyond happy with the results. The roll is just heavenly and melts in your mouth it’s so good. This recipe makes 4 small rolls, however, you can make 3 medium rolls. Your personal preference. We really, really like cream cheese so I do a portion and a half of the cream cheese filling. Be sure to have the edges of the roll tucked under the roll so it doesn’t come undone when baking. The brand of flour you use will impact the amount of flour needed. You want the dough to be soft to touch BUT not sticking to your hands. Start out with 4 cups of flour, add additional flour as needed. This is the perfect dessert recipe to freeze for later. Once the roll completely cools, place it in a freezer Ziploc bag and freeze. 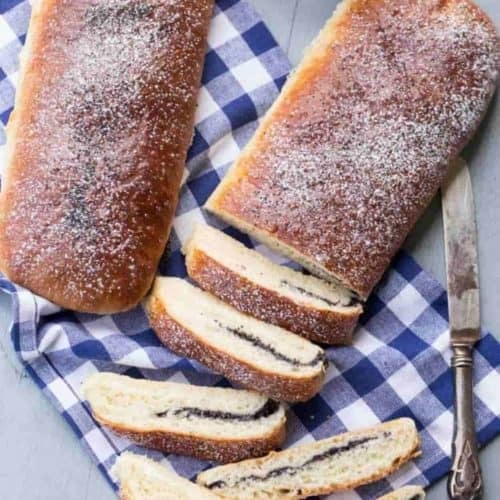 Thaw the poppy seed and cream cheese roll and enjoy. I like it warm so I even place it in my oven for a few minutes and it feels like you just baked it. You can either lightly roll the roulade (as the final picture of the images shows in the video) or you can fold it over, as described. 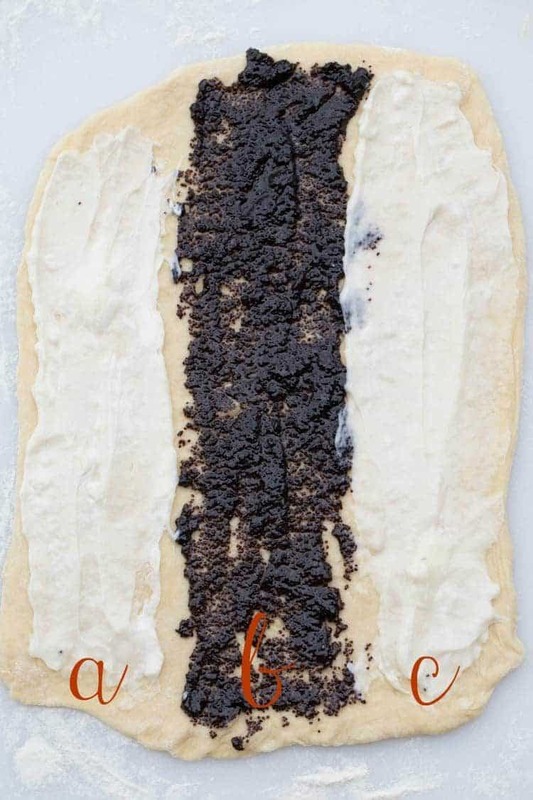 If you will just lightly roll into a roulade, then spread the poppy seed over all of the dough and then the cream cheese over the poppy seed filling and lightly roll up. If folding in three; fold part (a) over part (b), then fold part (c) over part (a). 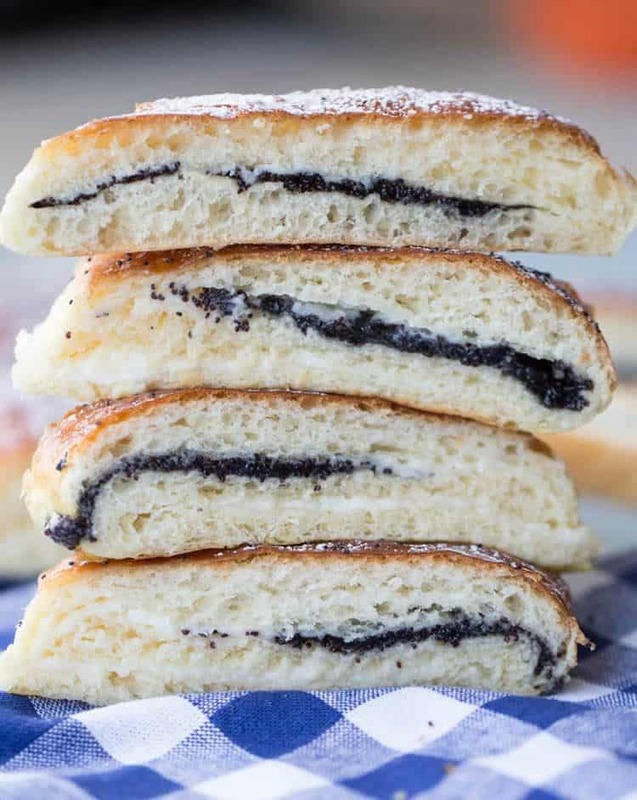 Or you can add cream cheese to half of the roll and poppy seed filling to the other hand and fold it over (as shown in the video). Once the roulade completely cools, dust with flour. Enjoy with some cold milk, hot tear or a cup of hot coffee! Poppy Seed Bars– Simple poppy seed bars recipe! Poppy Seed Cake– Delicious poppy seed cake with a dulce de leche cream. Poppy Seed Roulade– A great roulade recipe with poppy seed and sweet cream. Great yeast bread roll with poppy seed and cream cheese filling. Preheat oven at Step to 365°F at step 9. Cover two rimmed baking sheets with parchment paper, lightly spray with baking spray. Set aside. Prepare dough: Place flour in a large bowl. In middle of the bowl, create opening pushing flour to the sides. Whisk the 2 eggs and pour into the center of the flour. In a small saucepan, add butter, 1/2 cup sugar and milk, heat until very warm but not hot (no warmer than 100 degrees). Pour milk mixture into the beaten egg. Sprinkle yeast over milk mixture, sprinkle 1 tablespoon sugar over yeast and let sit 5 minutes, allowing yeast to activate. Cover bowl with plastic wrap then a towel and allow to rise at room temp for 1 1/2 hours. Meanwhile, beat cream cheese and 1/3 cup sugar; set aside. Lightly dust surface with flour. 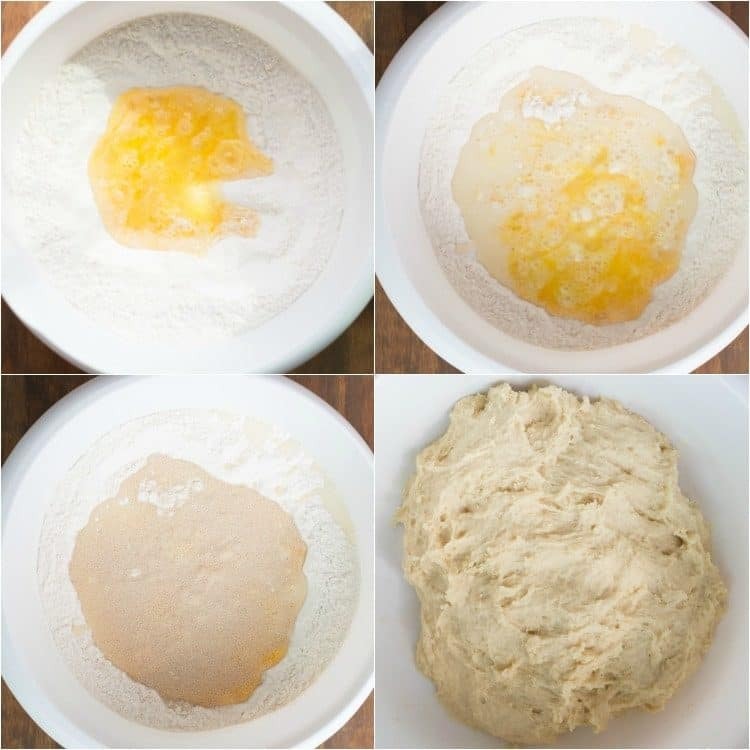 Transfer dough onto surface and divide into four parts. Whisk egg and water for egg wash and brush tops of rolls. Sprinkle poppy seed atop rolls. Set aside to rise 30 minutes. Bake 25-30 minutes until rolls are golden in color. Once baked, transfer to cooling rack. Once cooled, dust with powdered sugar. Enjoy! Super great instructions. Was totally afraid of working with yeast but this turned out quite amazing! Wanted to say thank you for sharing. A friend from church made this, brought it to a gathering and everyone loved it! She shared the link with us, so now we are hooked on poppyseed rolls! Thanks for sharing that, Svetlana. That just totally made my weekend. 🙂 Please tell your friend I’m so grateful. Looks so delicious i need to make this bread! Your baby girl is sooooo cute in the video, I love when your kids do your recipes ?? Made this today and to the most amazing thing I have ever had… SOOOOO GOOODDDD!!! I am not clear on the folding process. Do I fold the one side towards the middle so that the cheese covers the poppy seeds. And then the other side towards the middle so that the cheese covers the plain dough? Do you pinch both ends closed as well as the long seam? Do you fold the ends under? Also,do you use all-purpose flour? Hi Christine, sorry to have confused you (and anyone else). I posted a close up with letters, I think that will help 🙂 <3..
Good quality flour is best. Maybe Canadian flour if you have it, or sapphire flour. All-purpose flour will work just fine if you don't have those. 🙂 Happy baking! Where can I find a can of poppy seeds? Russian store? This looks delicious!! Thanks, will be trying these this weekend. What’s the best way to store them? Room temp in a closed Tupperware container:). Or freeze them. This recipe is a keeper. My new favorite! Thank you so much for easy step by step tutorial. God bless you. Awwww, you are way too sweet and totally made my evening. I must agree though, it’s pretty fantastic and has been on repeat in our home a lot! Many blessing to you and your family as well. Thanks for visiting our humble online home<3. Can’t wait to try this. I am just confused though, lol sorry. So I just fold the roll over like so there in 3 layers and not roll it up? Right? Thank you for ALL the recipes!! The most perfect recipe. Made it twice since you posted.. Will make some more to share with my parents and husbands. THANK YOU! ? Love hearing that, Lena. Glad you enjoyed this easy recipe! Thanks for visiting our online home?.. Looks like an awesome recipe. Excited to make this asap. Thank you!